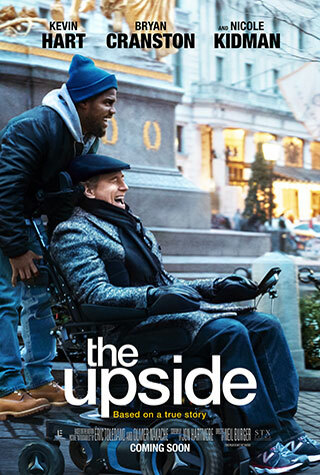 Besides minor adjustments with its story and certain supporting characters, Neil Burger’s (“Limitless”) The Upside is a fairly faithful remake of the popular 2011 French film “The Intouchables.” Both movies are inspired by the real-life friendship of French aristocrat Philippe Pozzo di Borgo and his Algerian caretaker Abdel Sellou and each highlight their dynamics of bonding despite their racial, cultural and economic differences. With this iteration, Academy Award nominee Bryan Cranston (“Trumbo”) plays Phillip, a best-selling business mogul who becomes a quadriplegic after a tragic paragliding accident. Despite the contrarian advice of his close confidant and company executive, Yvonne (Nicole Kidman, “Boy Erased”), Phillip curiously hires Del (comedy superstar Kevin Hart, “Ride Along 2”), an ex-criminal trying to redefine himself, to be his new life auxiliary caretaker. From the moment Phillip and Del meet they become fast friends, even though the true intimacy developed between best friends never fully resonates on screen. This deep connection, nonetheless, becomes an oasis from their current problems. This gloss over, however, can be easily overlooked because Cranston and Hart are so likable. And yet, their sincere efforts aren’t enough to make the chemistry memorable. For Hart, this is his first chance to play a more grounded character, but there aren’t any scenes that offer any deep dramatic range. And though Cranston enjoys a more complex role, it’s one that doesn’t challenge him like some of his past performances. Regardless, the film is earnest in establishing these sympathetic characters. Del we learn is an estranged father who constantly disappoints his frustrated teenage son Anthony and irritated wife Latrice (Jahi Di’Allo Winston, “Proud Mary,” and Aja Naomi King, “The Birth of a Nation,” respectively in scene stealing roles). Meanwhile, Phillip questions the purpose of his life in his current condition while grieving the loss of his wife, Jenny (Genevieve Angelson, “Spare Room”). The greatest problem with The Upside is not the characters or the lack of conflict around Phillip and Del, but the lack of conflict between them. Considering the very real differences between both men, no buttons are pushed or boundaries crossed that threaten the growth of their friendship, which defies established behavioral logic. The film doesn’t deny the surface-level ramifications of class and its effect on Phillip and Del. However, when it comes to racial issues, the film awkwardly side-steps it. Just as Del is painted to be a good-natured, non-stereotypical ex-con, the filmmakers don’t want Phillip to imbue any sense of racism, bigotry or discrimination because he’s a nice rich Caucasian guy. Instead, screenwriter Jon Hartmere pushes those sensibilities to come from the one-note Yvonne (Kidman is sadly wasted in this role), but mostly from Phillip’s conceited neighbor, Carter, (Tate Donovan, “Elvis & Nixon”). Further blemishing The Upside — it arrives at a time where there is much backlash and scandal surrounding it. It was supposed to be released by The Weinstein Company in 2017, however, when the Harvey Weinstein scandals arose, the film was put aside. In December 2018, Kevin Hart was selected to host the Oscars until criticisms from old homophobic tweets reemerged. Since then, Hart has had a roller-coaster apology tour that has dwarfed this film’s promotion. Cranston doesn’t get away unscathed either. Some fans and members from the disabled community are upset that a non-disabled man is playing a quadriplegic character. And while the film misses the opportunity to hire a disabled actor for Cranston’s role, it offers reconciliation with several touching moments which includes a pivotal and somber date scene with Cranston and Julianna Margulies (“Stand Up Guys”). It’s Cranston’s best moment although a disappointing reminder of what The Upside could have been if its characters were more vulnerable.